Knowing exactly how to spend your advertising budget is often the hardest part of marketing your small business. You want to make sure that every dollar you spend helps to grow your business. Without any information showing you exactly how well your previous advertising efforts performed this can be a big challenge. This is where Google Analytics can help. When set up properly, Google Analytics can show you where every visitor on your website came from and if they became a lead or customer. Filtering this data by campaign allows you to see an overview of how much business each of your advertising campaigns brought in. You are then able to make educated decisions on how to effectively spend your marketing budget. In part one of this article we covered how to set up Google Analytics on your website. We also discussed how to tag visitors from each of your advertising campaigns and track their interest in your company using basics metrics in the “All Campaigns” report. In this second part we will show you how adding events and goals in Google Analytics will show you exactly how much money each advertising campaign brought in! Before you can start accurately assessing how much money you’re making from your advertising campaigns you first need to establish how you make money from your website. Calling or e-mailing your business. Downloading a piece of content. Once you know what you want your visitors to do, you need to start tracking them. We do this by entering them into Google Analytics as your website’s “goals”. 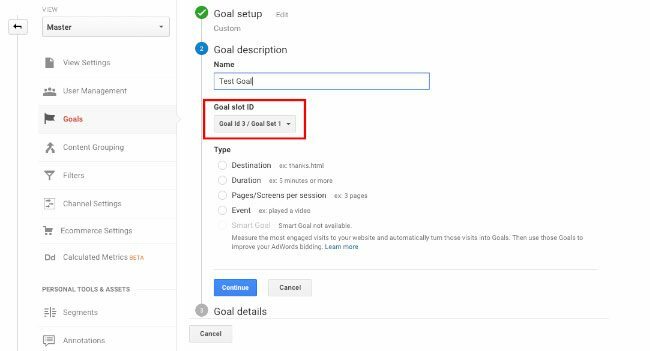 To set up a goal in Google Analytics first log in to your Google Analytics account. Once you’re logged in click on the “Admin” tab on the main navigation bar. Under the “View” column, click “Goals”. Click on the red “+New Goal” button to create a new goal. You can create a goal from a template or create your own custom goal. Select “Custom” then click “Continue”. First enter a name for your goal. The name you choose is up to you. You just want to make sure it is a name that you will be able to easily identify later. After entering your goal’s name you will then be prompted to enter a “Goal ID” and “Goal Set”. 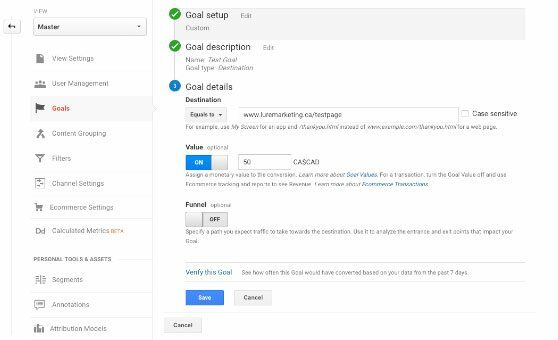 Google Analytics allows you to create up to 20 goals. Each goal is given it’s own unique ID. These ID’s are then divided into 4 goal sets. Goal sets are used to group similar goals together. You can simply ignore goal sets if you wish as they are purely for organization. Since this is our first goal we will select “Goal ID 1 / Goal Set 1”. Destination – Select this goal type if your goal is completed when a visitor lands on a webpage. This webpage is most commonly a “thank you” page that visitors reach after they complete a purchase or download a piece of content. Duration – Select this goal type if your goal is to have visitors stay on your website for a certain amount of time. 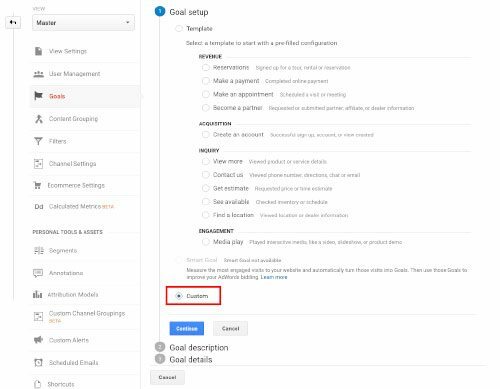 Pages/Screens per session – Select this goal type if your goal is completed after a visitor views a certain amount of webpages. This is a common goal for blog sites as their revenue comes from showing advertisements to their visitors. The more pages that visitors view, the more ads they are shown. Event – This goal type is used for all non-pageview goals like video plays and form submissions. To use events as goal we must first set up event tracking on our website. We will cover event tracking later in this article. Smart Goals – This goal will most likely not be available to select. Smart goals are designed for Google Adwords campaigns and are outside of the scope of this article. Once you have chosen your goal type, enter in your desired destination url, duration or number of pageviews that will complete your goal. Always remember to enter a value for your goal. This allows you to track how much revenue is brought in from each campaign. Leave “Funnel” off for now. Goal funnels will be covered in another article. You then have the option to add in a value for your goal. This is the dollar value that the goal is worth to your business. For e-commerce websites, assigning value to goals is as simple as setting the value to the price of what the consumer bought. A product that retails for $45 will therefore have a goal value of 45. What if you don’t sell products on your website though? How do you assign a dollar value to a phone call or lead capture form? To assign value to a goal we have to figure out how much average revenue a customer completing that goal will generate. To do this you will need to know the total number of leads and sales that your business had last year (or last quarter). Figuring out how much a lead is worth is then simply a matter of dividing your total sales in that time by the total number of leads generated in that time. For example, if your total sales last year were $250,000 and you had 250 leads, each lead was worth $1000 to your business. This value can be used for all lead generation goals like form submissions. 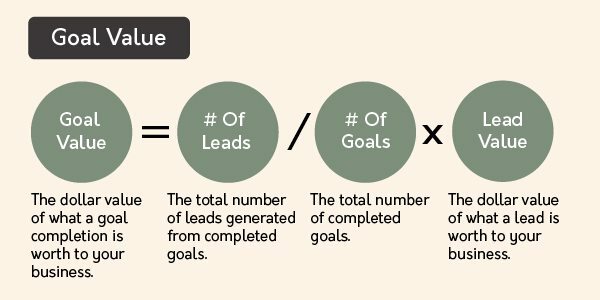 What if only some of your completed goals will actually turn into leads though? For goals such as phone calls and e-book downloads that don’t always generate leads you will need to go one step further. To properly assign value to goals such as these you need to find out how often these goals turn into leads. Turn that fraction into a decimal value and multiply it by your total lead value. If you get 1 lead out of every 5 phone calls, multiply your total lead value by 0.2 (1/5). This will give you the proper value for that goal. Now that you know how to value your goals, click the save button. Your finished goal will then be listed in the “Admin” tab under “Goals” in the “View” column. Your completed goal will now appear in your goals list. You can click on the name of your goal to edit it or click “Recording” to toggle the goal on and off. By default Google Analytics is only capable of tracking page views. What if we want to track on-page interactions like click to call buttons or form submissions? In order to be able to track non-pageview visitor interactions like these you need to add event tracking information to your website. Events are snippets of code that are added to webpages. These snippets of code give Google Analytics the information it needs to track and categorize non-pageview interactions on your website. Events are made up of 4 tags; category, action, label and value. The event category tag is a way to group similar events that you want to track. For example, if you wish track multiple form submissions, you would use “form” as their category label. The event action tag is the action that visitors take to trigger the event code. If you want to track when visitors play a video, the category tag would be “video” and the action tag would be “play”. Event label tags allow you to provide additional information about the events you wish to track. Unlike the event category and event action tags, the event label tag are unique to every event. They provide a way to differentiate between similar events. Let’s say we have two different videos on our website and want to track when visitors watch them. Without the event label tag we would be able to see that a video was played but not which one. The event category tag (“video”) and action tags (“play”) would be exactly the same for both. Adding the video title as an event label tag allows us to tell them apart. The event value tag sets a value for the event. They should be set to the dollar value that the event is worth to you. Set this value the same way we outlined earlier for assigning value to goals. We now need to add event tracking code to our website. Doing this can be a little tricky and is outside the scope of this article. For a thorough explanation check out this article by Optimize Smart. If you’re having trouble or aren’t comfortable adding code to your website contact your web developer or give us a call. 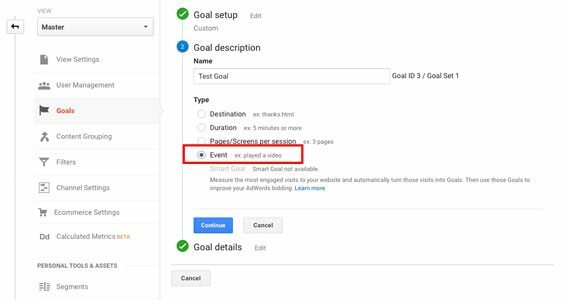 Adding an event type goal to your Google Analytics account is very similar to the goals we added earlier. First select “Custom” under “Goal Setup”. Next enter your goal name, ID and goal set. Select “Event” as your goal type and click “Continue”. You will now have to enter the event category, action, label and value tags you selected for your event. 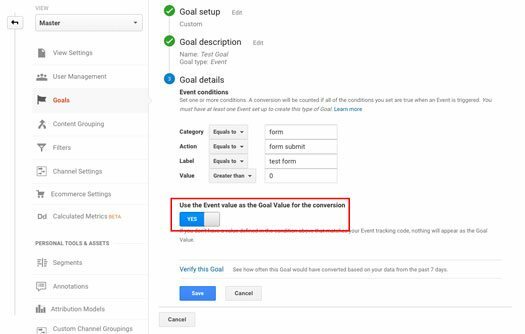 Ensure that “Use this Event value as the Goal Value for the conversion” is toggled to “Yes” to ensure that the goal is accurately tracking the value of your event. After entering your event details make sure that “Use Event Value As The Goal Value For The Conversion” is toggled to “Yes”. Once you’ve verified that everything is properly set, click “Save”. Now that everything is set up we can start tracking how well our campaigns performed. For this we will again use the “All Campaigns” report in Google Analytics. To access this report first click on “Acquisition” on the left navigation bar. In the drop down menu that appears click “Campaigns” then “All Campaigns”. 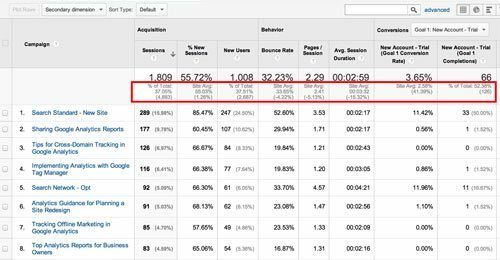 This report shows you how every campaign that you have tagged is performing.The first three columns (labeled “Acquisition”) show you how many visitors each campaign brought to your website as well as how many of them were new visitors. The middle three columns (labeled “Behaviour”) show engagement metrics like how long the visitor stayed on your website and how many pages they viewed. The final three columns (labeled “Conversions”) show you how many goals the visitors of each campaign completed and the total dollar value that these conversions were worth. The acquisition and behaviour sections were covered in part one of this article. We will now focus on the conversions section of the “All Campaigns” report. The conversions section is split into “Goal Conversion Rate”, “Goal Completions” and “Goal Value”. Goal conversion rate is the percentage of visitors from that campaign that completed one of your goals. Goal completions is the total number of visitors that completed a goal. The goal value is the total dollar value of all goal completions for a campaign. By default you will see combined data for all the goals that you have created. To see how your advertising campaigns performed for a specific goal, click the dropdown beside “Conversions” and select the goal you want to review. To help judge your campaign’s success, look at these metrics in relation to your website averages. This can be seen in the second row of the report. The “Site Average” and “% of Total” stats give you meaningful benchmarks to assess how your different campaigns are performing relative to each other. Any campaigns that are underperforming in all three metrics should be looked at very closely and either be abandoned or significantly changed. Any campaign that is performing better than average should also be looked at closely to see if there are any lessons to be learned and applied to other advertising campaigns. You should also consider increasing the budget of the campaign to maximize it’s potential. What about the campaigns that are in between though? How do we know what to do with them? Note: Any campaigns designed around completing a specific goal should only be judged based on their performance for that goal. An advertising campaign designed to get newsletter subscribers shouldn’t also be expected to sell a lot of product! For campaigns with both over performing and underperforming metrics first look at the goal value of that campaign. Any campaigns over performing in terms of revenue are definitely worth keeping. Note: When assessing campaigns by the revenue that they bring to your company don’t forget to factor in how much you are spending on the campaign, in terms of both time and money. If a campaign is converting at a high rate but the total number of conversions are low, look at ways to get more traffic to that campaign. This usually means increasing its budget to allow it to be shown to more consumers. If increasing your overall budget isn’t an option look at pausing a lower performing campaign and utilizing its budget. A campaign with a ton of conversions but low conversion rate is either targeting the wrong consumers or is advertising something that isn’t being properly shown on the landing page of the ad. For instance, a consumer that clicks an ad that advertises a deal on a specific TV is taken to a general page for all TVs. When you have a campaign with a low conversion rate first look at the web page that consumers see after clicking on your ad. Does it clearly relate to the ad they were just shown? If not then consider changing the landing page of the ad to one that does. If you don’t have a web page that directly relates to your ad consider either having one built or stopping the ad campaign. Another potential problem you should consider is your ad targeting. Many advertisers make the mistake of targeting too many consumers with their ads. Focus on displaying your ads to your ideal customers only. Your ads will be seen by less people but you will spend less and convert a much higher percentage of your target audience. After making changes to your campaigns continue running them for at least two weeks. If their performance starts to improve you know you’re on the right track, if it doesn’t then it may be time to abandon the campaign. While setting up events and goals in Google Analytics might seem like a lot of work it is well worth the effort. Properly tracking how your visitors interact with your website allows you to see exactly how well each of your marketing channels is performing. Once you know how much revenue each channel generates you can begin to make informed decisions about how to better spend your marketing budget. 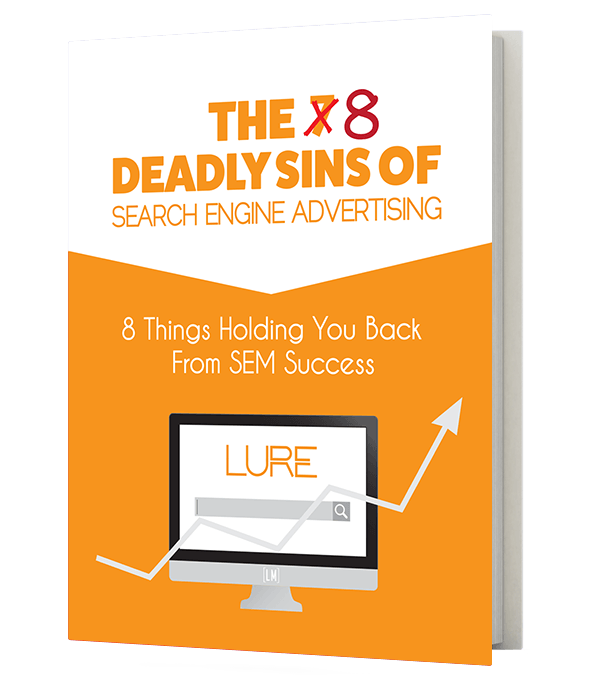 If you liked this article check out our free e-book; The 8 Eight Deadly Sins of Search Engine Advertising.